I have done a whole lot of cooking, but getting round to posting has been my biggest challenge…. too many things going on in this life of mine! 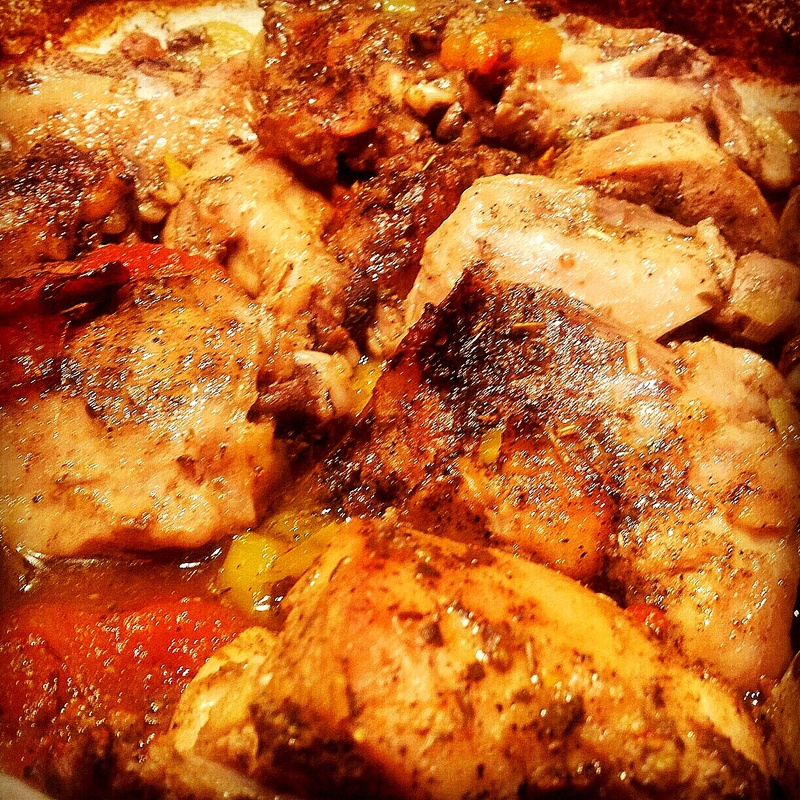 So without the long stories about what I have been up to, my recipe for Greek roast chicken. Wait! I will have to give you one little story… I have been spending a whole lot of time at home, in front of the telly, watching mostly the Food Channel. One of my favourite shows is Guy Fieri’s Diner, Drive-ins & Dives; I’m sure you have all caught it at some point! So one particular episode was this little Greek restaurant and on the show the owner/chef made a simple roast chicken that looked absolutely divine, I just had to try it out myself. Now if you know anything about me, my memory is a bit shait and so when it comes to remembering ingredients, more often than not I forget the important ones! However, with this recipe I remembered most of them… the recipe is just that simple! In a large roasting pan, add the chopped onions, tomatoes and garlic. Toss in a little olive oil. *You can add potatoes here too as they will soak up the gravy as they cook. 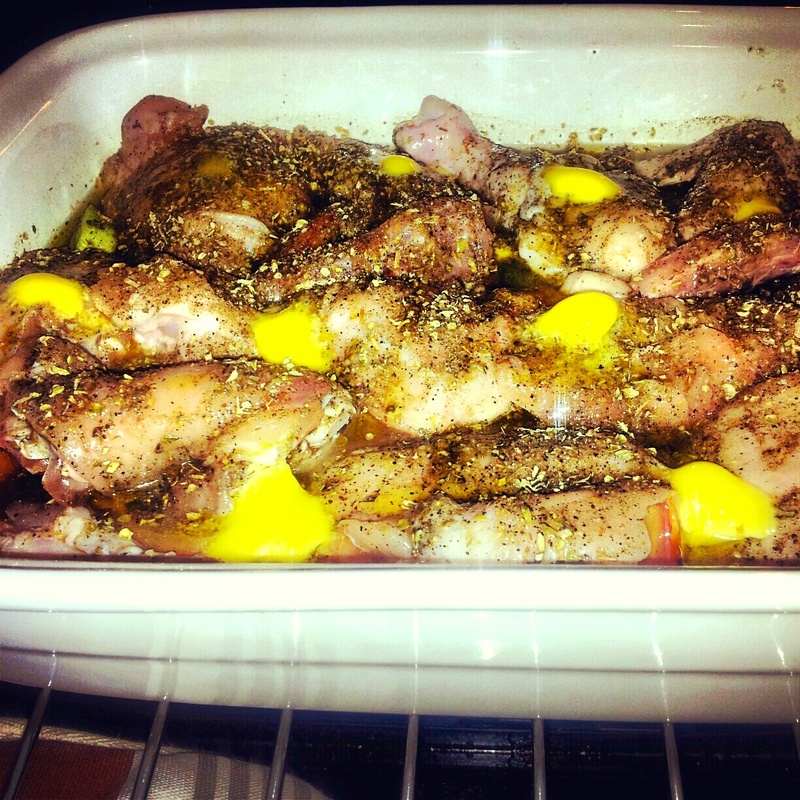 Put the chicken pieces in the pan, rub down with olive oil and season with garlic powder, salt, pepper and oregano. Divide butter into small cubes, I just scooped out little knobs. Scatter the butter throughout the pan. Add the water and wine to the roasting pan, filling about 1/4- 1/2 the pan depth. I added more wine than water… that’s just how I roll! Put this in the oven for about 40 minutes to an hour. I like my skin crispy but not dry so I left it in a little longer. It helps to baste the chicken during cooking so that it doesn’t dry out. The chicken that comes out the oven however…. 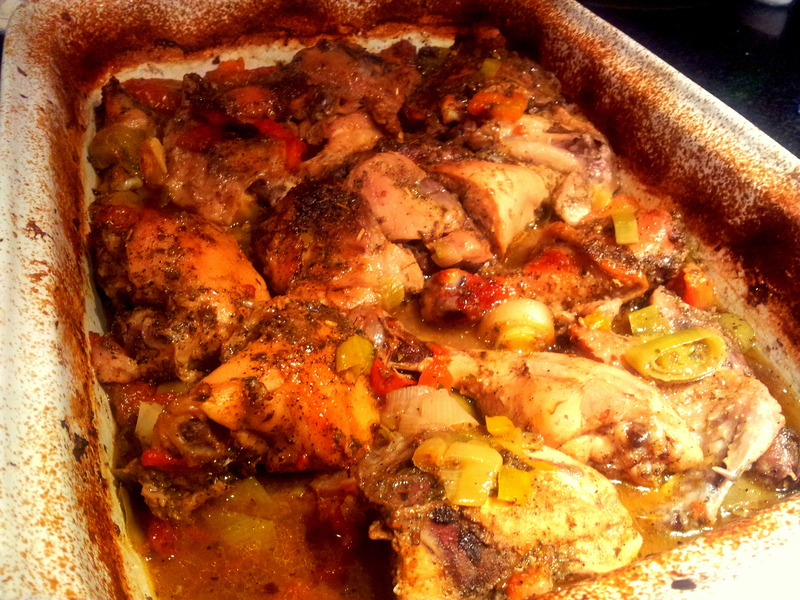 is the most juicy, fragrant, most delicious chicken you will ever come across! Take this as my peace offering for the long absence…. A little bit of this Greek chicken and I know all shall be forgiven!